An annual tradition in Valencia County NM since 1984. 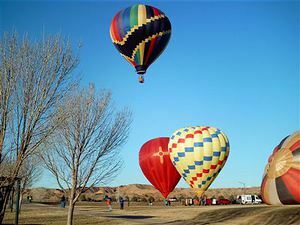 This has become the second largest balloon rally in NM, and the second largest Special Shapes event in the American Southwest. Join us for three days of family fun, food, prizes, and of course balloons! I-25 to Camino Del Llano in Belen, turn north on Mesa, then left on Delgado, then right on Eagle Lane.